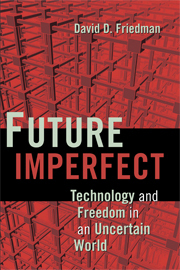 Future Imperfect author David Friedman was recently interviewed on KCSB Santa Barbara’s The Marketplace of Ideas. Lew McCreary, writing for Harvard Business review, recently commented on Future Imperfect. ‘We want the world to be orderly, but too often it is simply a mess. Friedman, a law professor, gleefully sorts out a host of messes having to do with a wide range of world-changing technologies. For every manifest benefit (say, reducing crime through universal surveillance), there’s a gnarly negative (adios, privacy). Friedman doesn’t duck the big issues: the death of copyright protection; nanotechnology; cloning, genetic engineering, and other advanced reproductive therapies; cognitive enhancement through pharmacology; the growing difficulty (due in part to tools that allow users to veil their identities) of enforcing contracts in cyberspace.